The American illustration movement found many of its roots in the Brandywine River area. The Wyeth family and Howard Pyle inspired generations of important illustration for many of America's leading publications and books. We have had the opportunity to represent some of the important names in American illustration and are always looking for great works. If you do not see an illustrative work you are looking for, please call or email, we may not have cataloged it yet." 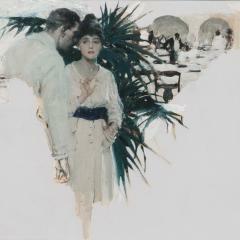 A beautiful rendering of a moment between a couple on a formal Summer evening.